Shirahana Remi-san no Hair Arrange 1 Remi gives a tutorial on doing hair. Member of the 4th group of Sky Fairies and 1st group of Sky Navigators. The first live Takarazuka performance she saw was Flower Troupe's That's Revue. However, she'd seen videos before then thanks to a middle-school classmate who was a big fan. Due to influenza, was absent during the Tokyo run of Side Story: The Rose of Versailles -André- / Exciter! on November 3rd and 4th. On 3/4/2011, hosted the opening ceremony of "JR Hakataza City," a new train station/mall, with Yumeno Seika. Fan report with pictures. Loves Anna Sui and Tsumori Chisato clothes. Has scars on her forehead from a childhood accident that she covers with makeup. Took the entrance exam three times before getting in. After failing the first two times, she had to bargain with her father: high test scores in exchange for one last chance. Of the characters she's played, Remi says she's most like Michelle from The Bund/Neon Shanghai: opinionated! Because Paula from Prisoners of Lilac Walls was almost opposite to her personality, quiet and passive, it was her hardest role. Close to Kurenai Yuzuru, who Remi says took care of her when she entered Hoshigumi; Suzumi Shio, who helps Remi organize her tea parties, designed one of Remi's seals, and sometimes handmakes jewelry for her; and Ouki Kaname--she was often paired with all three on stage. 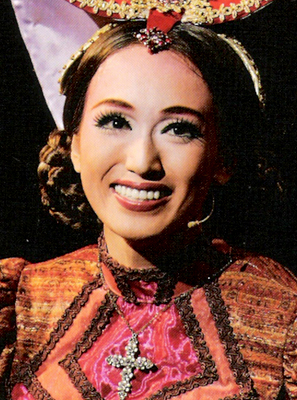 Post-retirement, she regularly meets Shio for Takarazuka-viewing dates, has visited Yuzuru's ochakai, and appears in many of Kaname's concerts. Created by bunretsu. Last Modification: Saturday 26 of January, 2019 08:43:51 PST by caithion.